TORONTO – When LeBron James looks over to the Toronto Raptors bench, it is a constant reminder of the biggest stain on his resume, the most glaring obstacle to his claim to G.O.A.T. status, the thorn that makes every NBA Finals loss that much more prickly. There’s losing to an all-time coach in Gregg Popovich or an all-time team in the Golden State Warriors, but when current Raptors head coach Dwane Casey implemented a defensive scheme for the Dallas Mavericks to expose James’s inability to execute basketball’s most essential skill, he lost to a team that should never have even been in the same room with The Heatles in terms of talent. It has apparently inflicted a wound so deep that it’s led to fake beer sips, popcorn eating on the sideline, and left handed alley-oops off the backboard en route to crushing playoff wins against the Raptors. James has destroyed every defensive scheme Casey has thrown at him, and on this Thursday night, he ended it with jump shots that were the very foundation upon which Casey’s schemes with the Mavericks were built. The Raptors were just starting to believe they could stage a comeback, too. Casey turned to the reliable Bench Mob as the game slipped away from the starters and they cut a 14-point deficit to 10 courtesy of a pair of three-pointers from Fred VanVleet and C.J. Miles. But, showing the killer instinct the Raptors have so clearly lacked over a game-and-a-half of this series, James knocked down a fadeaway three, before driving right at Pascal Siakam to finish at the rim. After Jeff Green opened the fourth quarter with a three of his own, James went about dismantling any semblance of a soul the Raptors had remaining. The King made two turnaround fadeaway midrange jumpers over Kyle Lowry to the most sobering of gasps from the 20,000 odd on hand at the Air Canada Centre, then made another couple for good measure, assisted a Green three-pointer, and then, incredulously, two more fadeaways to balloon the lead to 18. LeBron James made 7 fadeaway jumpers in Game 2. That is tied for the most by any player in a playoff game since the data became available in 2001-02. The player he is today finished with one of his best playoff road performances with 43 points, 14 assists and eight rebounds to lead the Cavaliers to a resounding 128-110 victory over the Toronto Raptors and a commanding 2-0 series lead as they head to Cleveland for the next two games. 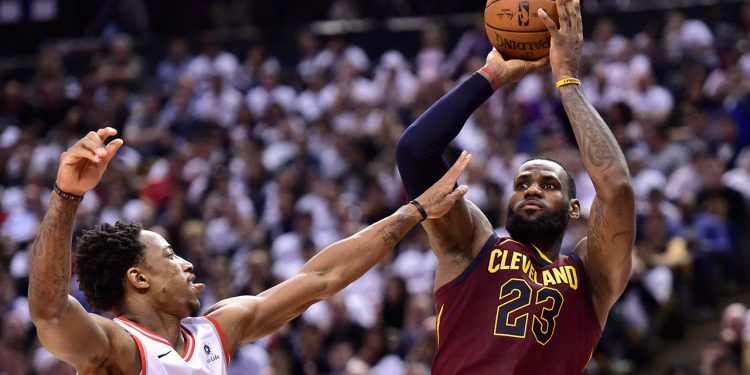 While James’s decimation of the Raptors’ playoff hopes was as subtle as an elephant on a tight rope, Cavs’ head coach Tyronn Lue also provided some interesting tidbits that make one seriously question some of the way in which the Raptors have gone about their business. After their Game 1 overtime win, Lue said he had no issues sticking with Kevin Love as the team’s starting centre. Lue sounds convinced here that despite the Lithuanian putting up the first 20-20 performance in Raptors’ franchise history, the Cavaliers were the ones with the advantage. They played it this way last year, too. Trading twos for threes was a simple math game, but add in the relative infrequency of Valanciunas’s usage on the offensive end in combination with Love’s best night of the playoffs and the advantage multiplies. Love scored 31 points in vintage fashion, mixing in his low post game with a couple of three-pointers and seven foul-shots. That he was allowed to get in a rhythm at all, though, was to the surprise of Lue. “In the second half, they went small, and we were able to post Kevin against C.J. and DeRozan a few times,” Lue said. He also credited Indiana head coach Nate McMillan for keeping Love in check during the first-round, with a simple yet effective strategy of never letting him touch the ball. Casey’s hands were tied to an extent. With Serge Ibaka becoming unplayable and Jakob Poeltl floundering, there were only so many options for Toronto’s head coach. Yet, trying to hide Miles and DeRozan on an all-star power forward was akin to throwing sheep into a sleeping lion’s den. Love went 5-for-5 against the pair, with most of them coming in the third quarter when began their takeover. Over two games, it’s hard to identify what the Raptors have definitely looked to accomplish on the defensive end. James has got his, Love has been awakened, and so have the rest of Cleveland’s role players. This is all on the heels of the Pacers committing to one strategy: shutting down everyone but James and stretching the Cavaliers to seven games and almost sneaking away with the series. It’s hard to argue it isn’t mental for Toronto at this stage. Casey questioned whether his team had the yips after Game 1, and then suggested there may have been a carryover effect from the overtime loss into Game 2. For all the effort they’ve put into resetting their style of play and expectations as a result, it’s the lack of assertiveness when the game is at its most tense that continues to leave the team falling short. Once again, when faced with a molehill, the Raptors made a mountain. They played well in the first half just as they did in Game 1 and carried a two-point lead into halftime, but when Cleveland went on an 8-0 run to begin the second half and Toronto had to summon the best of their collective wills, there was nothing. James’s pride in showing Casey just how far he’s come is willing him to be better in what is now remarkably his 15th season. That 2011 series is useless film now, but the same process that was once used to expose his flaws is the one he now annually ingests to myth-bust the Raptors.